This week’s challenge is to design a calendar widget. It may be for any platform (Think: Android widget / Windows 8 Panel / Windows 7 “Widget” etc) and may have any theme you wish. 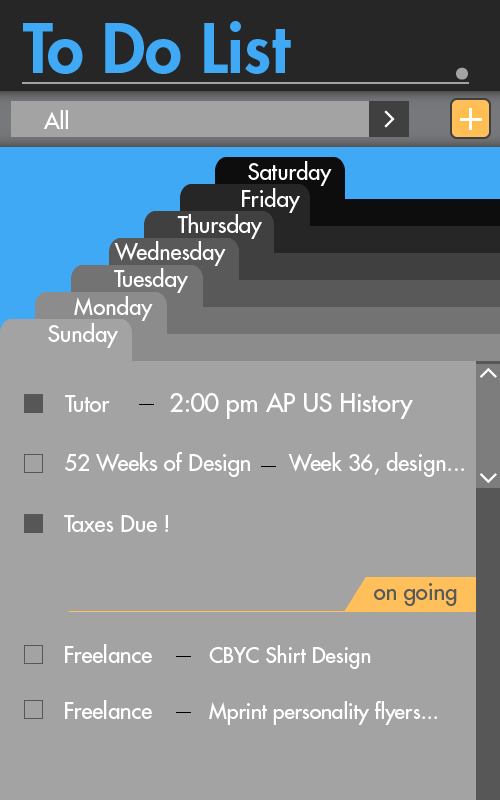 You can make it so that it displays a month, or a week, or it displays the upcoming appointments etc. I’m terrible at using the calendar on my phone, so I chose a mobile setting for the challenge this week. I do really like making lists and especially like seeing as much info as possible like you typically would on a whiteboard. So with those things in mind I started mocking up a mobile weekly calendar. While it doesn’t harness the chaos and potential scannability of a huge whiteboard, I like the idea of being able to flip day to day and have on going stuff always there so you don’t forget about it.